Can I Freeze Unused Cupcake Batter? A small baking dish filled with manicotti. 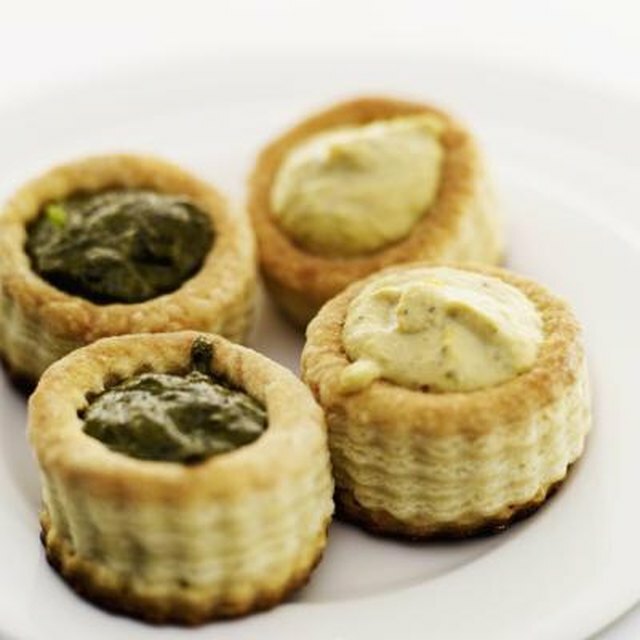 1 Can Puff Pastry Appetizers Be Made in Advance? 3 Can I Freeze Unused Cupcake Batter? Large pastas such as manicotti freeze well, providing the convenience of preparing manicotti ahead of time. If you make your manicotti from scratch, you can fill them before freezing individual meal or pans full of your homemade recipe, or use a trick to separate the crepes before freezing for assembling the dish at a later time. Preparing manicotti in baking dishes cuts down on preparation time when you're creating a meal for a dinner or an event. For freezing, preparing the manicotti in microwave- or oven- safe containers ensures that the completed dish is ready to bake. 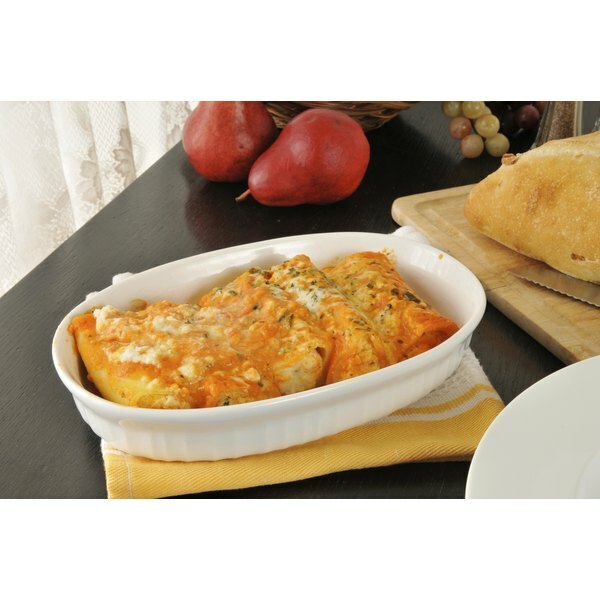 Tempered glass baking dishes work well for freezing and baking large or small manicotti meals. Tomato sauces interact with metal and foil, and tomato can stain permeable surfaces such as plastic serving savers. Freezing manicotti involves preparing the manicotti recipe as usual and assembling it in the desired baking pan. An airtight container reduces the risk of freezer burn. Tempered glass pans are freezer- and oven- safe. Choosing a baking dish that comes with an airtight lid helps to protect the manicotti in the freezer. Alternatively, seal the container with cling film to prevent freezer burn. Placing the manicotti dish in a level position in the freezer ensures that it freezes correctly, without the risk of the shells shifting to one side of the dish or the other. For individual or casual meals, you can prepare and freeze small servings of manicotti. Wrapping individual servings, such as two to three stuffed manicotti, in plastic wrap or waxed paper creates simple meals right out of the freezer. Preparation requires only unwrapping them, putting them in a heat safe container for cooking. Add sauce right before heating them. Alternatively, zippered freezer bags provide a convenient means for freezing small servings of manicotti, such as four to six stuffed manicotti for a dinner for two. If you make manicotti from scratch, you can either make up the recipe for stuffed manicotti or freeze the crepes with waxed paper between each one. Thaw the manicotti in the refrigerator overnight and add 10 minutes to the baking time. Large rectangular baking pans work well for laying out stuffed manicotti in rows to create an attractive presentation. Alternatively, arranging manicotti like the spokes of a wheel in a round baking dish creates an appealing display. Cutting some of the shells in half and placing them between the spokes near the edges of the plan creates child-size portions or easy-to-serve portions for guests with smaller appetites. Dry pasta, such as manicotti, keeps indefinitely in an airtight container, according to the University of Kentucky. It isn't necessary to freeze unprepared pasta.